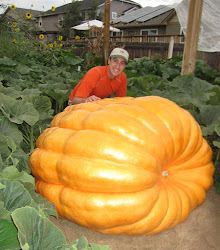 The 2145 pumpkin is bigger now than the 1974 pound. I could see a little more than a week ago that the 2145 pumpkin, which is a week younger, was gaining on the 1974 pumpkin. Did a measurement on the pumpkins this morning and the 2145 pumpkin is about 30 pounds more and seems to be still growing faster per day. What was the ott inches? Wish we could stop by on the tour tomorrow.